I’m not one to watch the nightly news. So every now and then, I search the news on line to keep up dated on what is going on in the world. 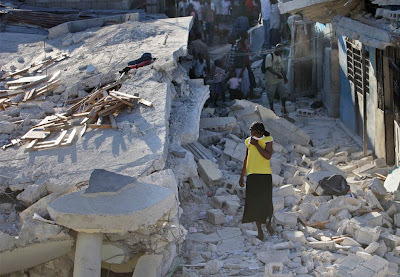 I had heard a lot about the earth quake in Haiti, so I began to search around to see what I could find. If you look hard, there is a lot of raw video footage taken right after the earth quake. It was amazing to see the devastation. Sadly, this is one of the poorest countries. They didn’t have much, but what little they had was reduced to rubble and dust. Dead bodies lined the streets. Gangs started to patrol the streets with machetes in hand, taking what little food there was. Mass panic was every where as people were hungry,thirsty, and in need of medical care. The Dominion Republic was offering medical care to their neighbors (if you could get there), but most people couldn’t make it so they will have to wait for workers and supplies to come. In the front yard of a hospital, the injured gathered, while ONE doctor was attending 300+ people in need of care. He said that he quit counting after 300. After seeing the raw video footage of what really happens after an earthquake, I was amazed and I felt compassion for them. Right after watching the video footage, I found a paper with some verses from Matthew. Jesus seen the people around him and felt a great affection for them because they were in a sad and pitiful shape, harassed,discouraged, and without leadership. Jesus shows the contrast of how there is a small amount of laborers and a large quantity of harvesting to do. We are told to ask with urgency for God to send out workers in to his field. As we look at the world events, lets be reminded that life is precious and short. There are many who haven’t heard that it is Jesus Christ that can put them in a right relationship with God the Father. Pray for workers. This entry was posted in doctor, dominion republic, earthquake, gangs, Haiti, hospital, injured, machete, medical, medicine, panic, raw video by Downpour. Bookmark the permalink.